5:1 Design Factor, Suitable for Overhead Lifting. Lightweight and versatile, web slings are a very commonly used rigging component. They are constructed of fibers woven into webbing and the webbing is sewn to meet the desired specifications. 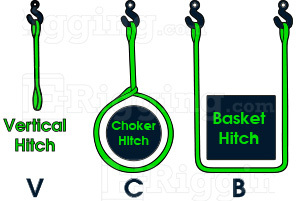 E-Rigging offers synthetic web slings sewn with polyester webbing. In the past, most web slings sewn in the U.S. were made of nylon webbing. For years, the rest of the world has made these slings out of polyester webbing because polyester stretches less. And when lifting an item, the general thought is that stretch is not good. But years ago, operators in the U.S. became familiar with how nylon handled and it became the standard. Due to the rising cost of nylon, industry in the U.S. is now moving steadily towards polyester and soon, it will become the universal standard and nylon will be used far less. One of the versatile features of making web slings is that they can be sewn into different configurations, eye types and multiple plies to increase strength. The two basic configurations are eye x eye and endless (grommet shape). Eyes can be made flat, twisted or tapered. And slings are commonly made with 1, 2 or 4 plies sewn together. The most common web slings are eye x eye two ply slings with flat or tapered eyes. In addition to adding more plies or layers of webbing to make the sling stronger, wider webbing can be used. 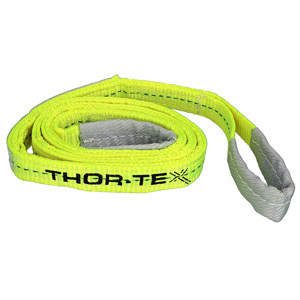 The common strength of webbing used to make synthetic web slings is 9800 lb/in webbing. What that means is a single ply of 1 inch webbing has a straight pull breaking strength of 9800 lbs. 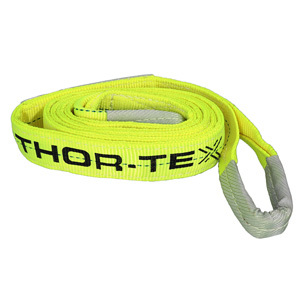 For 2 inch webbing, the breaking strength would be 9800 lbs x 2 and 4 inch webbing would be 9800 lbs x 4. 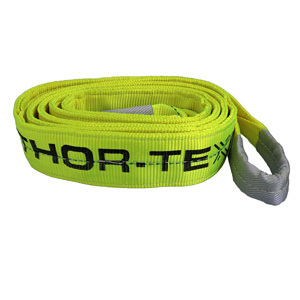 Perhaps the only significant concern of using synthetic web slings is they are more susceptible to being cut or damaged than wire rope or chain slings. That being said, it important to inspect these type slings regularly after use.